#stampinup My BFF, Lynn Birus, makes such beautiful cards. I always look forward to my birthday because I know I'll have a special card just for me! This one is a prototype for a card we'll be making at Lynn's stamp camp this weekend. I can't wait! Lynn stamped the round citrus piece from the "Apple of My Eye" stamp set in Daffodil Delight onto Whisper White and punched it with the 2" Circle Punch. She added the seeds in Basic Black. Next, Lynn stamped the leaves in Old Olive onto a Whisper White mat and added some grungy elements in Pear Pizzazz and Basic Black from the "Gorgeous Grunge" stamp set. She stamped the sentiment from the "Apple of My Eye" set in Basic Black. 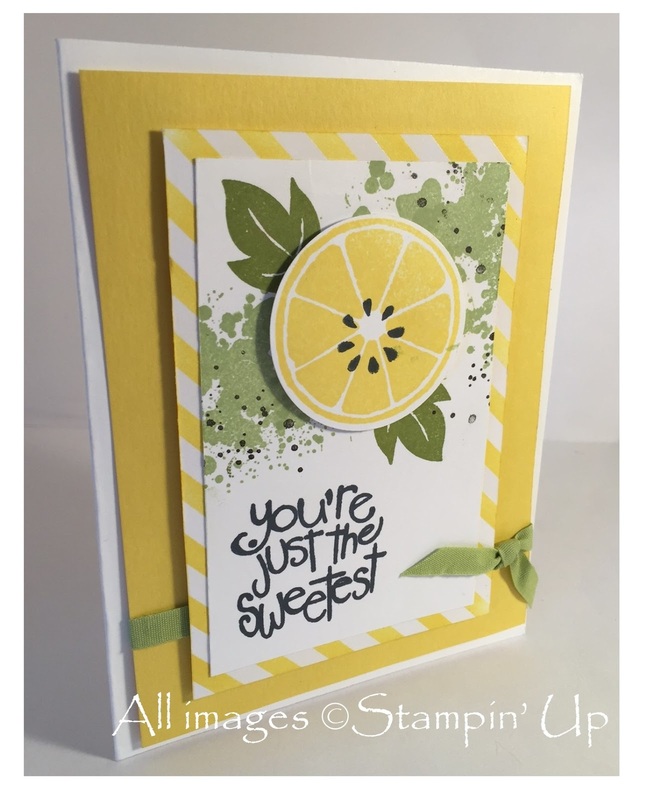 Lynn adhered the lemon to the panel with Stampin' Dimensionals. Next, Lynn sponged some Daffodil Delight Ink onto a striped piece of Color Me Irresistible Specialty Designer Series Paper and layered that behind the stamped image. She added a length of Pear Pizzazz 1/4" Cotton Ribbon to a Daffodil Delight panel before adhering the main image to the card with Stampin' Dimensionals. Finally, she added the whole assembly to a Whisper White Thick Card Stock card base. This card is super cute and I just love it! Thanks, Lynn!